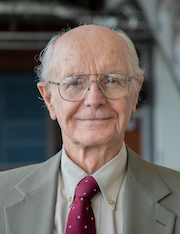 Dr. Marlan O. Scully directs advanced Quantum Optics Laboratory at the Baylor Research and Innovation Collaborative (BRIC). A primary focus of the Quantum Optics Laboratory (QOL) is using Raman spectroscopy techniques to observe vibrational, rotational and other low-frequency modes in a system. The technique has led to a method of anthrax detection that can identify the biological weapon in just one femtosecond (one millionth of one billionth of a second), making it suitable for use in large, public buildings. In other work, QOL researchers are applying laser spectroscopy to the field of biophotonics toward devising systems capable of early detection of cancer and osteoporosis and methods for reshaping the eye. The technology also is being used to develop a means of identifying aflatoxins from peanut and corn mold. In another project potentially benefitting agriscience, researchers are employing the lab's femtosecond titanium-sapphire laser in a technique known as laser-induced breakdown spectroscopy to characterize the effects of drought on an array of fruit-bearing and ornamental plants. Dr. Scully's interests span a variety of disciplines and he has published in diverse academic areas including physics and chemistry, environmental science, biology, mathematics, religion and philosophy.